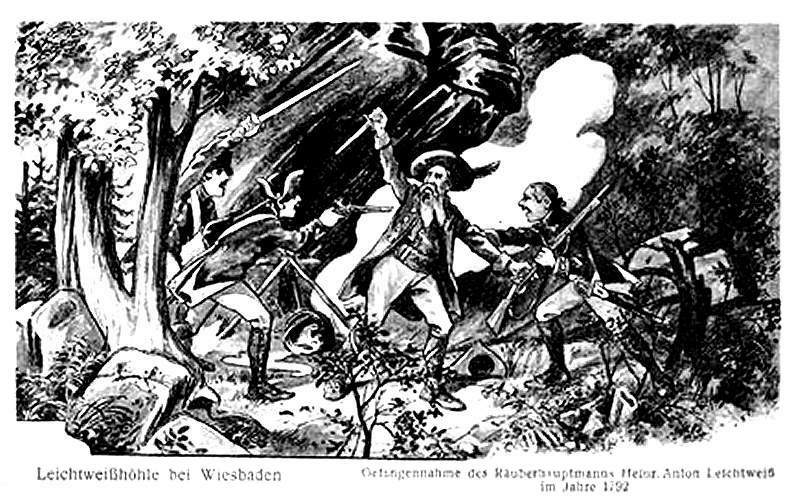 Image: the outlaw Heinrich Anton Leichtweiß was captured at the cave in 1792. Location: In Wiesbaden. West of the Neroberg, north of Wiesbaden. B417 to the north, north of the Israelischer Friedhof tiurn right. Höhlenwärter: Rudolf Driess, Tel: +49-611-54539. 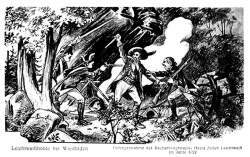 1792 the outlaw Heinrich Anton Leichtweiß was captured at the cave. 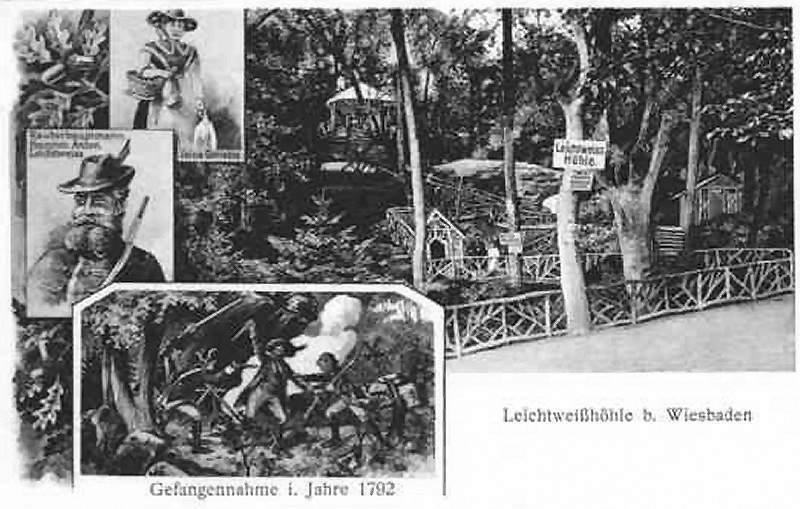 Image: postcard from the Leichtweißhöhle, from the 19th century. 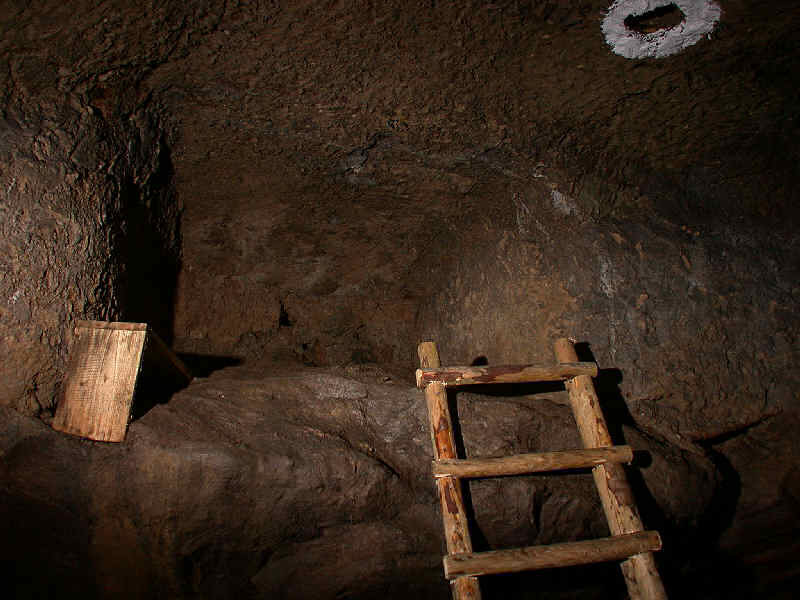 The Leichtweißhöhle is named after Heinrich Anton Leichtweiß, who is said to have used this cave as a hideout. 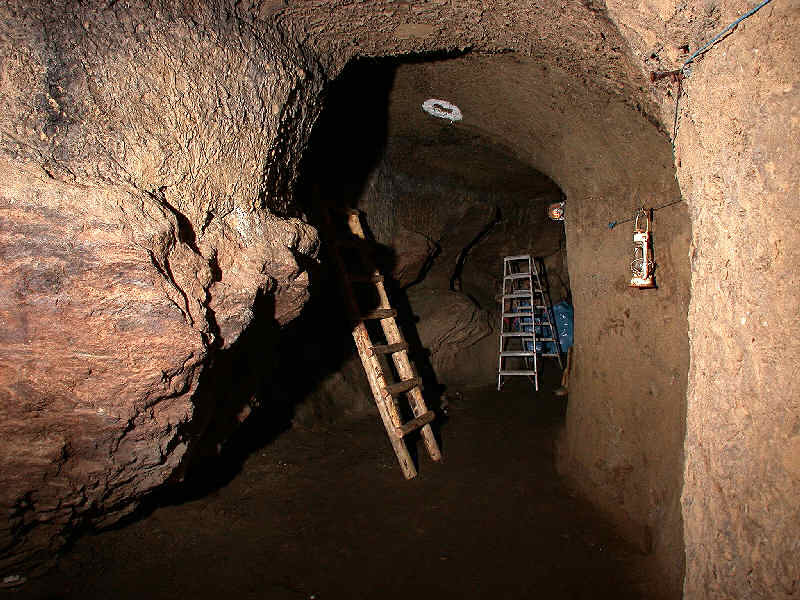 Image: entrance of the cave. The story of Leichtweiß is a legend, very famous during the 18th and 19th century and definitly modified and garnished numerous times. Some people talk about the outlaw Leichtweiß, others of the poacher Leichtweiß. The whole story seems to be a typical story of the romanticism, based on motives of Robin Hood and similar stories. Such stories satisfied the unknowingly desires of the poor people to resist and insurrect against the oppressing authorities. 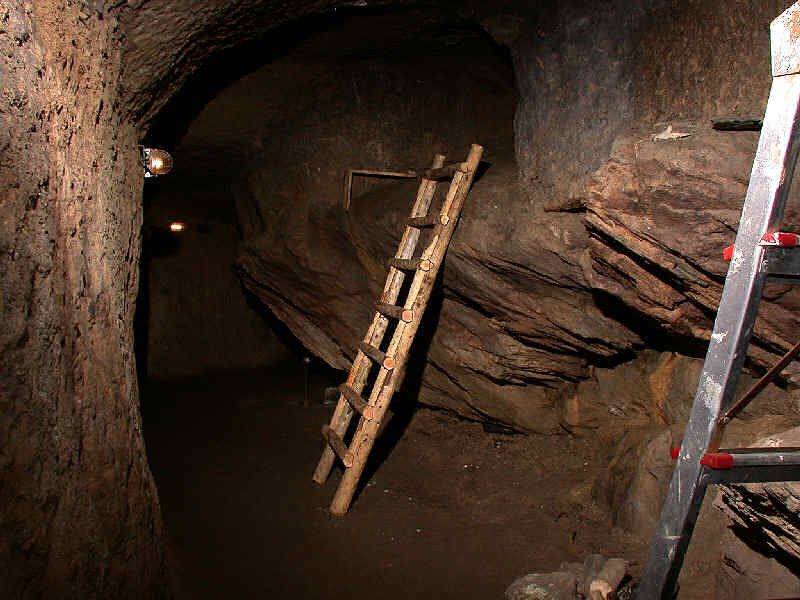 The Leichtweishöhle was admited as the place, where the outlaw lived, and so it was a famous and well visited sight as early as the middle of the 19th century. The cave was developed, trails, benches and pavilions were built. Some postcards from this time are preserved. Today the cave is not famous any more, only the locals still know about it. 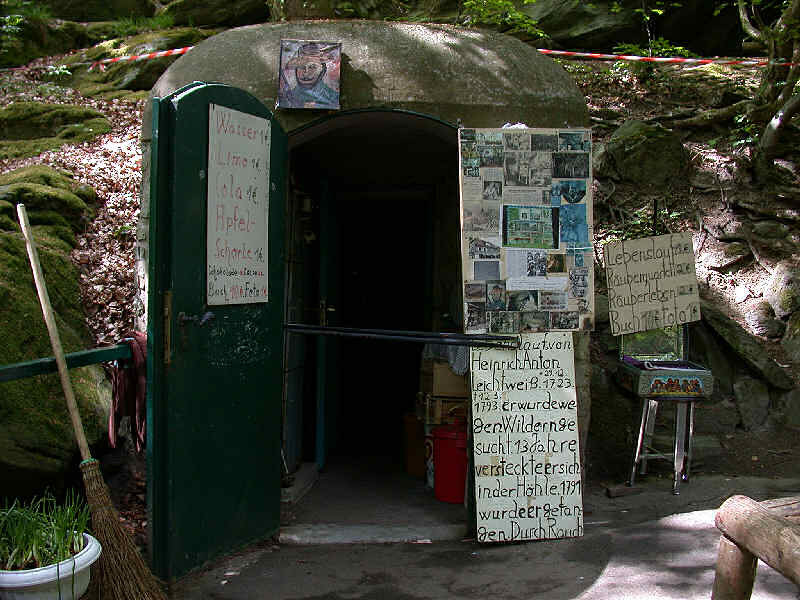 But it is still possible to visit the cave and it is mentioned sometimes as the third show cave of Hessen. 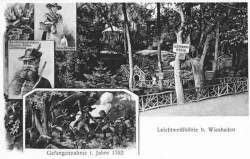 At some days of the week, an employee of the Amt für Grünflächen, Landwirtschaft und Forste (department of greenswards, agriculture and woods) of Wiesbaden makes guided tours and tells the story of the outlaw Leichtweiß. There are two different ways to write the name Leichtweiß. 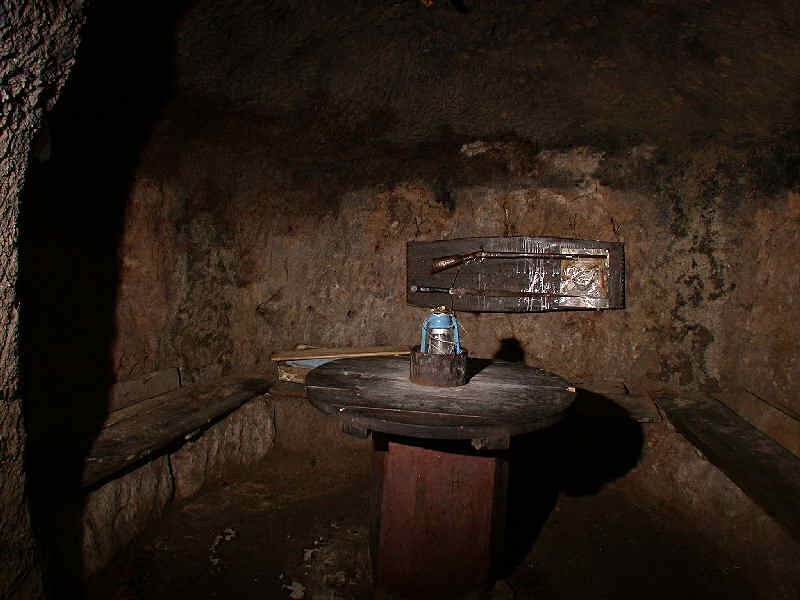 The name was originally written Leichtweiß with an ß or ss at the end, but today it is written with a single s. For the cave both the names Leichtweißhöhle and Leichtweishöhle are common. On this page we used the older version. 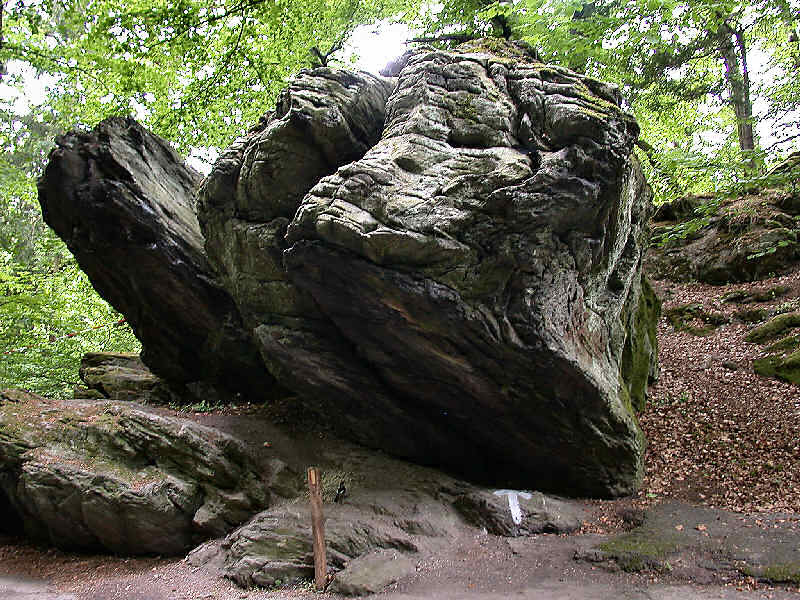 The Leichtweißhöhle was originally a natural cave, but more or less it was rock shelter, not a real cave. The rocks are slate, which is not soluble and is thus not karstified. No other caves exist in the area. The shelter was modified artificially over the centuries, the original situation is hard to make out.